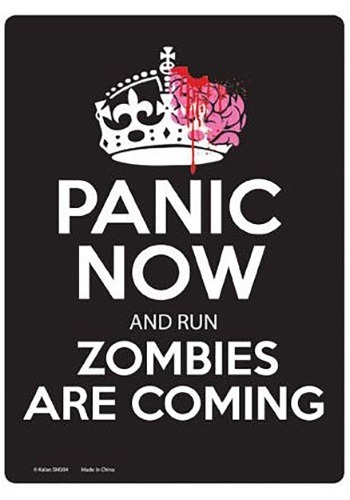 When it comes to the zombie apocalypse, a healthy warning is everything. We're not all in the scouts, we all can't always be prepared. The best we can do is subtly look for fortresses that we could hole up in if hordes of the undead flooded our town. Checking out the bars on the lower level of the public library during times of peace might give us the upper hand when everyone else is trying to nail planks on the windows of their houses. But let's be honest, most likely we'd panic like everyone else. When it comes to this classic scenario, the best-laid plans usually fail! The best you can hope for is that you didn't wear platform sandals on that particular day! No boring posters for you! This sign takes your decor to the next level. It's made from tin, so whether this decor is seasonal or year round you don't need to worry about it deteriorating in storage or on the wall. The black base has a hole in each corner, making it easy to hang on most surfaces. So, if you're putting together a zombie-themed party this year, you might as well choose some signage that lets people know what's going on. Want to take the look to the next level? Browse through the rest of our decor to add unique touches such as bloody window clings and horrifying lawn ornaments. People won't know what hit 'em!